The year is flying by and it’s hard to believe that we’re approaching Easter already. I have to admit it has snuck up on me a bit! I’ve been busy crating with the lovely paper launches this month which include a complete new range of six Simply Creative paper pads, plus two new First Edition pads – Let’s Celebrate and Botanical Beauty. I have been working on a few magazine features using the new Let’s Celebrate pad, so I am making lots of different cards - some with die cuts, some with stamped sentiments and lots with lovely bright patterns as the focus. There are some wonderful paper designs with illustrations by Louise Tiler that are perfect for fussy cutting and creating card toppers. From Dalmatians in party hats, to flamingos on unicycles, this pad just screams ‘party’! If you haven’t already seen it, take a look at my cake topper tutorial on the blog. I made one large cake topper and a couple for cupcakes too. It’s my son’s birthday this week so we may just have a panda party of our own! 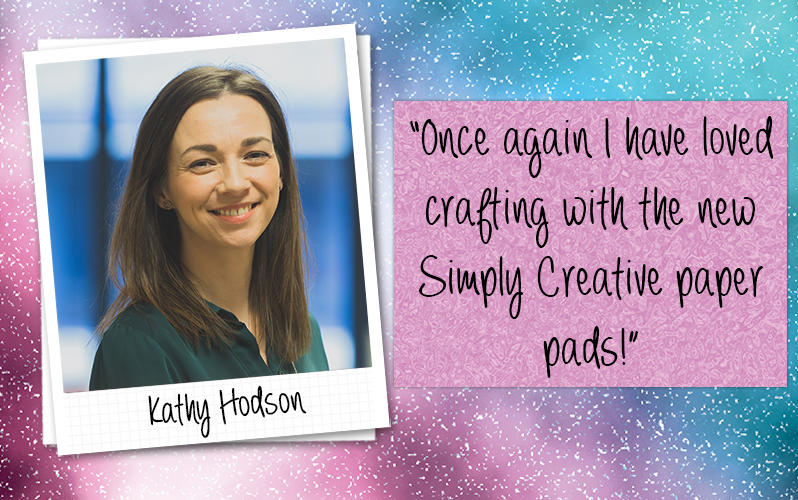 Once again I have loved crafting with the new Simply Creative paper pads! Another six dazzling designs to create papercraft projects that really stand out. I created an extra special card to welcome a new rainbow baby to the world using the Razzle Dazzle paper pad, which was just perfect for this theme. I loved making it, knowing it would mean so much to the parents who have wanted their baby for so long. I also made some paper flowers using the Floral Luxe 12” x 12” pad and a space-themed stepper card with an acetate panel to add more die cut shapes from the Stargazer papers. These were just some of the selection of samples I made for the Trimcraft shows on Create & Craft in early March. The good news is we have another show planned for Easter Monday with these papers, plus a huge range of dies, so there will be some bargains to be had with new bundles and offers! I’d also like to take the opportunity to thank everyone who attended my workshops at the CHSI Stitches trade show in Birmingham in February. Attendees included workshop hosts, store owners, online retailers and charities, and they were all given a goody bag of items from the inaugural V&A Papercraft Collection. I demonstrated how to make origami dresses using 6” x 6” papers which are perfect for card toppers. Once again, even though everyone had the same craft stash and topper design, there were lots of different finished cards at the end. It just goes to show, the only limit is your imagination. Failing that, a quick visit to the Inspiration page of The Craft Blog should give you all the inspiration you need! FAbulous projects here, and I too loved the dresses. I made one for my granddaughters confirmation a few years agfo, and it looked a lot like one of these, but it was made with a cakeserviet though, but also very lovely. Love this kind pf great embellisments, we can make ourself.